Paris Saint-Germain's French Ligue 1 title celebrations were delayed again when they suffered an embarrassing 5-1 defeat to second-placed Lille on Sunday. The capital club, who already missed out on the opportunity of an early celebration when they drew at home to Strasbourg last Sunday, would have clinched their eighth title by avoiding defeat, and can now do so if they win their game in hand at Nantes on Wednesday. "We're going to be champions but we cannot lose like this," France forward Mbappe told Canal Plus. "It's not normal. We lack personality, it's one of our flaws, we have to correct this. We played like debutants." The 20-year-old had two goals disallowed for offside and PSG lost Thiago Silva to a muscle injury inside 16 minutes to put him in doubt for the French Cup final against Rennes in two weeks. Lille went ahead after Thomas Meunier diverted a Jonathan Ikone cross into his own goal in the seventh minute. Four minutes later, Juan Bernat volleyed home from Mbappe's cross to equalise. However, the fullback was shown a straight red card shortly before the break when he brought down Pepe as the striker was rushing towards goal. Christophe Galtier's side went 2-1 up six minutes into the second half when Pepe beat the offside trap to score from close range. 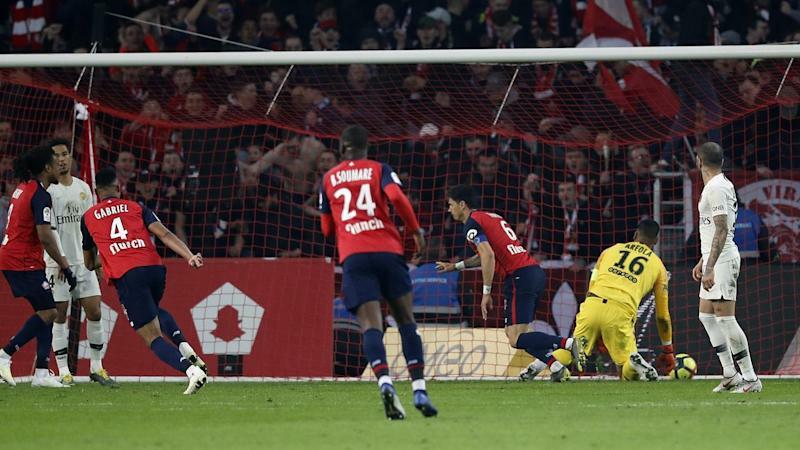 Lille scored another in the 65th when Jonathan Bamba out-paced the defence and beat goalkeeper Alphonse Areola. Gabriel Magalhaes and Fonte sealed an emphatic win for the hosts with a header each in the 72nd and 84th minutes. It was PSG's heaviest league defeat since Qatar Sports Investment took over the club in 2011. QSI have invested more than one billion euros ($S1.57b) on players since they took control. Earlier on Sunday, Saint Etienne moved up to fourth when Mathieu Debuchy's double helped them thrash Bordeaux 3-0 at home. St Etienne have 53 points, three behind third-placed Lyon who occupy the final Champions League qualifying spot. Veteran striker Souleymane Camara scored a 78th-minute winner as sixth-placed Montpellier beat Toulouse 2-1. Rennes are 10th after hitting the woodwork three times in a 0-0 home draw with eighth-placed Nice.